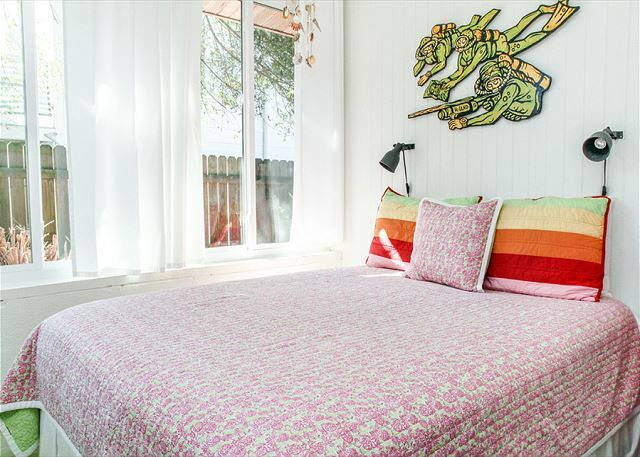 The flamingo pink on this mid-century cottage makes you feel like you're in another era! One of two private patios. Bright and colorful hot and cold running outdoor shower! The front of the cottage has this private ouside seating area. Perfect to enjoy the sun and relax. 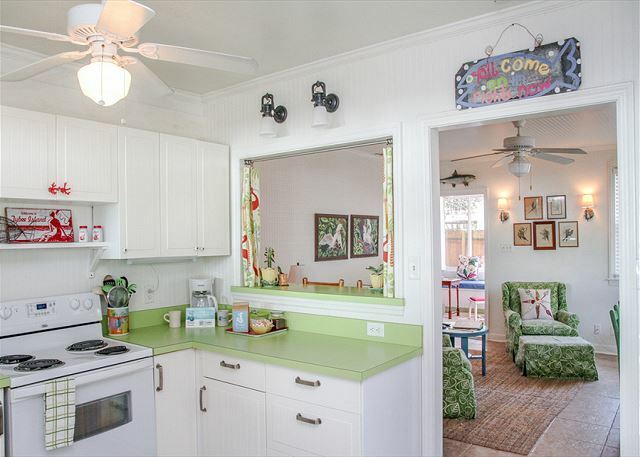 Bright, vintage inspired kitchen with kitschy retro touches! Kitschy kitchen flows into the living/dining room. Indoor patio-type room ~ enjoy the sunshine or the rain in this cozy floor to ceiling windowed room! Scuba room with queen bed. Off the Florida sunroom. Queen room #2 with queen bed. Super comfy. Queen room #1 is across the hall and bathroom is across the hall as well. Queen room #2 (the Marlin room). Shared bathroom for Scuba room and Marlin room. Queen bedroom #1 has a private bathroom. Queen room #1 with private en suite bathroom that also leads to the outdoor shower. Covered outdoor patio with comfy furniture. Perfect for you alone or the whole family! Covered patio right off the kitchen for easy cocktail hour! 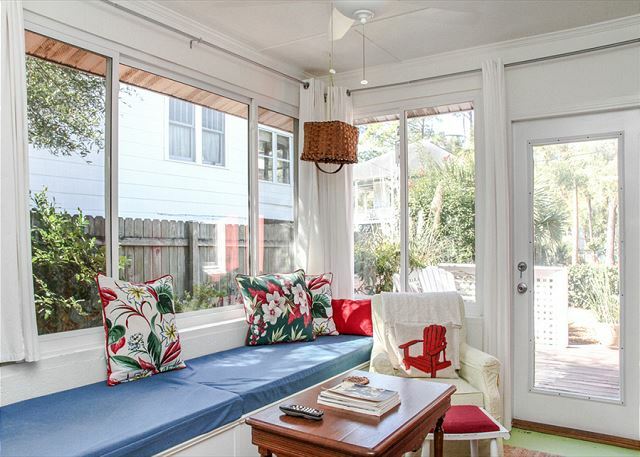 Great private patio off the Florida sunroom for sunny coffee and quiet drinks. Pulling up to Castaway can only make you smile in anticipation! The bright and fun exterior is just a preview for the fun inside! Mermaid Cottages welcomes you to Castaway! Easy to find, easy to get lost in! Fabulous landscaping takes you to another place and time. Vacation perfect! Love this outdoor shower! Hot and cold running water and it's private! Walk on up for a drink any time. Great private patio off the Florida sunroom for private chats and family moments. Fun outdoor shower with hot and cold running water! Castaway your cares and come inside! We're vacation ready! This color is so scrumptious! 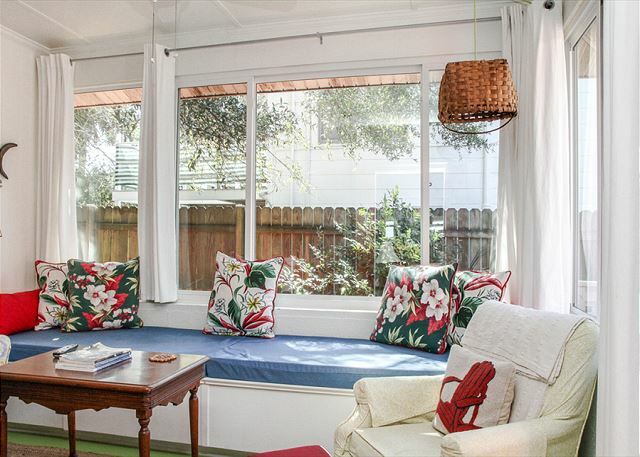 Adorable private patio for sun and dream gathering! 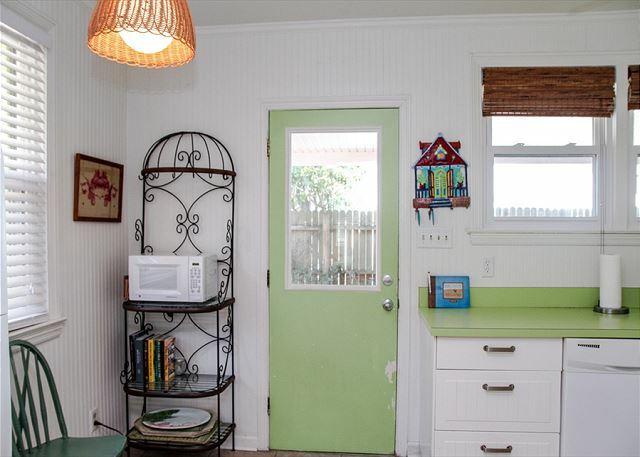 This bright green door leads into the Queen #1 bathroom/laundry room. Cozy garden seating. Outdoor shower here and Queen #1 bedroom inside the windows. Grilling in this backyard is wonderful! Bring your grilled items right to the covered patio for outdoor eating or quickly into the kitchen! 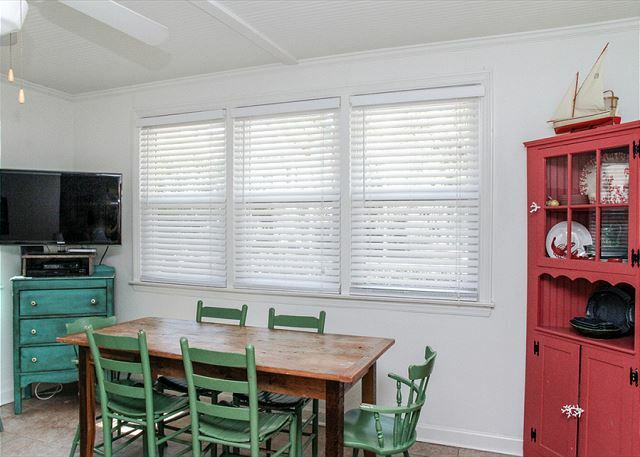 Adorable retro touches in the living/dining room. Kitchen is right off of here so you won't miss the action! Flat screen TV makes relaxing here a treat. 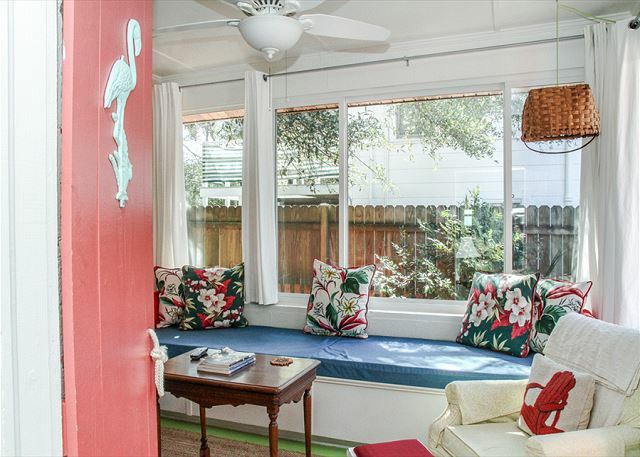 Comfy tropical seating is just another wonderful touch in this great cottage! Dining for 6 is right next to the kitchen for easy service and clean up. Dining and living room are right off the kitchen for family good times! Bar seating, retro 1950s tropical feel! Such a perfect treat to rest your soul! 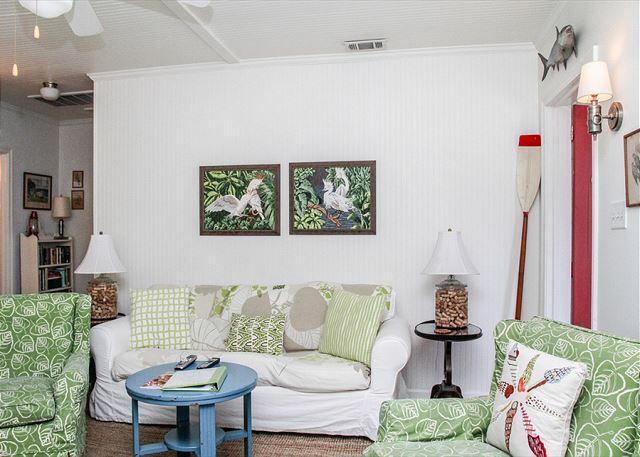 The decor and seating is so comfy you will instantly Castaway your cares in this home! The kitchen is right off the living/dining room with a pass thru window. Mai tai, please! 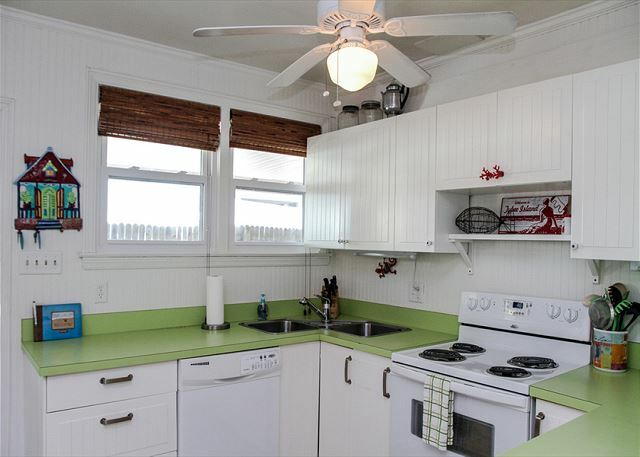 Great, colorful retro kitchen with all the modern conveniences. Pass thru window into the dining/living room makes serving and clean up easy. Dining/living room is right off the kitchen for great family time! Kitchen door to the covered carport. Welcome to Tybee Island! Be here in the present and enjoy the past! Lots of room in this full stocked adorable kitchen! Why, yes, you're welcome to take a Mermaid magnet home! Kitchen flows into the dining/living room. Bar seating on the other side of the pass thru window for 3. Florida room with tall windows make you want to curl up with a good book... or take a good nap! While the bedrooms have TVs, you're probably not going to need them with all the cute details in the home to keep your attention. Truly Instagram worthy! Florida room for hanging, napping, chatting, watching the sun or the rain. One of the private patios is right outside of here, too. 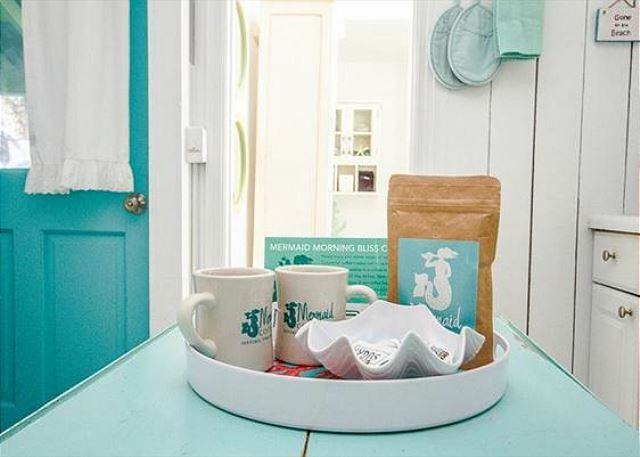 Walk from the Florida room to the patio for a morning cup of Mermaid Morning Bliss (MMM Bliss) or a drink in the evening. Private and lots of seating for all. Watch TV, watch the rain thru the huge windows, day dream, enjoy. Great bedroom details make you feel like you're walking into another time. Scuba bedroom has a super comfortable queen bed. This is off the Florida room. Scuba bedroom off the Florida room. Queen bed for perfect dreams. Scuba bedroom with queen bed. Great details in this room. Look at those tall windows for sunny days and starry nights! Hallway from the living/dining room to two bedrooms. Hallway details. Cocktail amenities here! 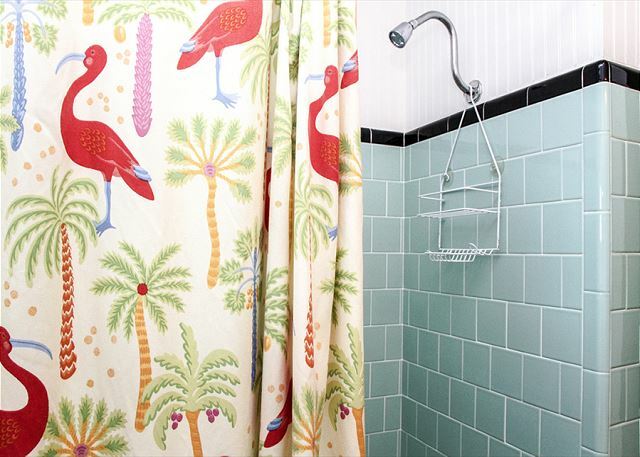 Shared full bath with more colorful flamingo details! Shared full bathroom with lush towels for all provided. 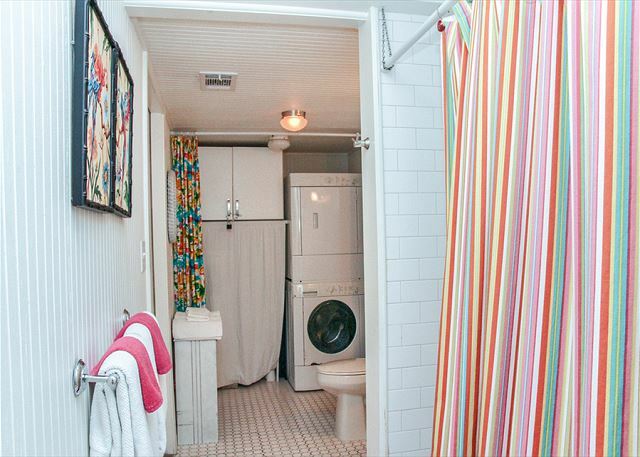 This retro shower and tub is amazing! Queen bedroom #2. Shared bathroom right outside the door. The details of this retro home were not lost and we so appreciate them! 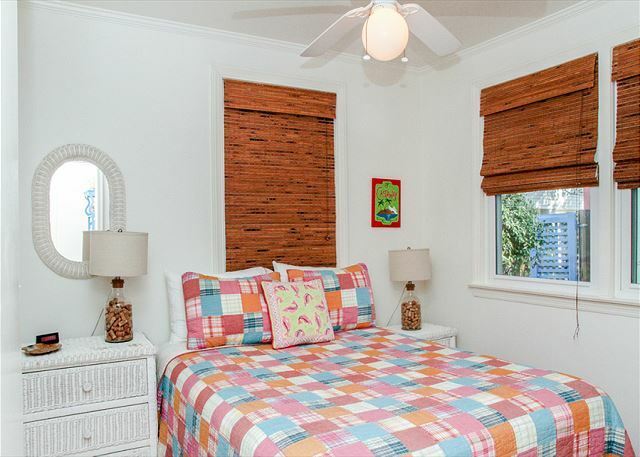 Queen bedroom with more bright and fun details! Love this queen bedroom. The bamboo shades are the perfect touch! Private bathroom off Queen bedroom #1 includes the stack washer and dryer and also the exit to the outdoor shower/backyard. Queen bedroom #1 bathroom includes a standup shower. Stackable washer and dryer are also in here. Door to outdoor shower/backyard is to the left. Queen #1 bathroom looking back towards standup shower and bedroom. Stackable washer and dryer for washing those plush towels! Great stand up shower! You can rinse off right outside in the hot/cold water outdoor shower or come in here and lather up too! 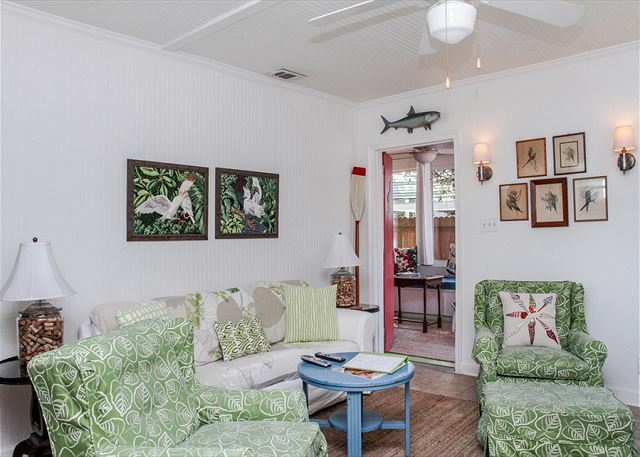 Classic fun, retro 1950's Ground level cottage, three bedrooms/ two full bathrooms. Just driving up to this colorful cottage you'll feel your cares Castaway! Bedroom 1: 1 Queen bed, Bedroom 2: 1 Queen bed, Bedroom 3: 1 queen bed. Pet-friendly (dogs AND cats! ), however, dogs are limited to 2 and must be under 25 lbs each. Picket-fenced front yard, private patios on both sides of the cottage. 3 blocks to the beach, and complimentary high speed internet and WiFi. Complimentary long distance phone calls! Outdoor Shower with hot and cold water. Extremely bright and cheerful cottage! House was nice, clean, two baths helpful for the four of us getting out early and on the water. Large kitchen table was great for a couple nights of cards and games. It was a another great new year at Tybee! We loved everything: the house, the food, the plunge and of course Mermaid Cottages💥?�⛄️ We will see you again in July(if not before). You make us feel like family! Castaway is even cuter in person! I would have enjoyed a softer pillow, but chalked it up to first world problems. Hurricane Michael passed just slightly above us our 2nd night there and our Castaway cottage wasn't scared at all. Super cute. Super convenient to beach, grocery, shopping, sight seeing. Will surely do Tybee again! We had a splendid time staying at Castaway on Tybee Island. Although I've lived in Georgia my entire life, I've spent very little time on Tybee. Well, we certainly plan to return. Thanks to the Mermaid Crew and being so attentive to our needs. Cozy, eclectic, convenient and comfortable. Nicely. We would stay here again. Very enjoyable. 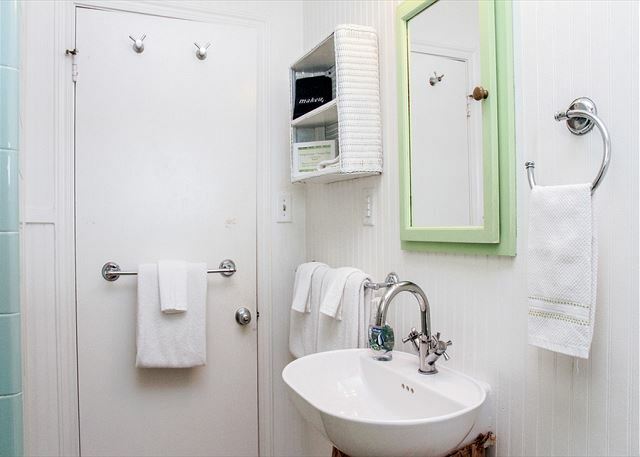 Mermaid cottages wants to ensure you are enjoying your stay. They will call to make sure everything is going well. The cottage was clean and very comfortable. It was quiet and in a good location. It was nice to sit outside and drink coffee in the morning. I only wish it had a screened in porch. The mosquitoes can be fierce. I would highly recommend mermaid cottages. We will use them again. I can't put into words how much fun we had on Tybee. It was amazing and much needed. Thanks so much. Amazing!! As Cute As the Photos!! Perfect location! 5 minute walk to a beautiful beach! The cottage was adorable, comfortable, and had everything we needed for a vacation. 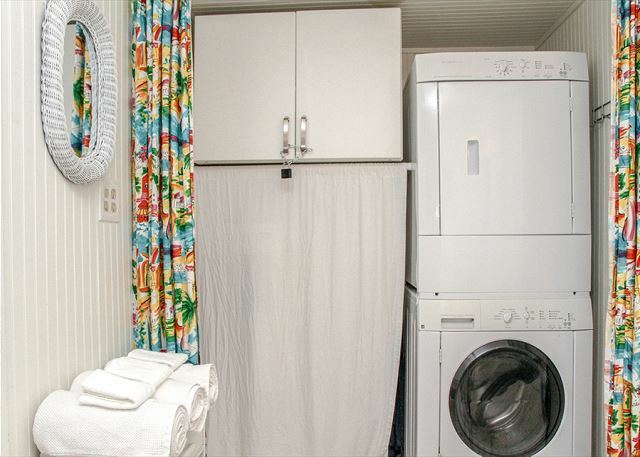 Excellant washer and dryer which was great for doing our beach towels each day! Layout was great for our group-felt spacious and yet cozy at the same time! Decor was adorable andfun! Great sunny, bright and cheerful cottage! We enjoyed sunny beach days, great trip to the lighthouse, and location was great for a few trips into Savannah. 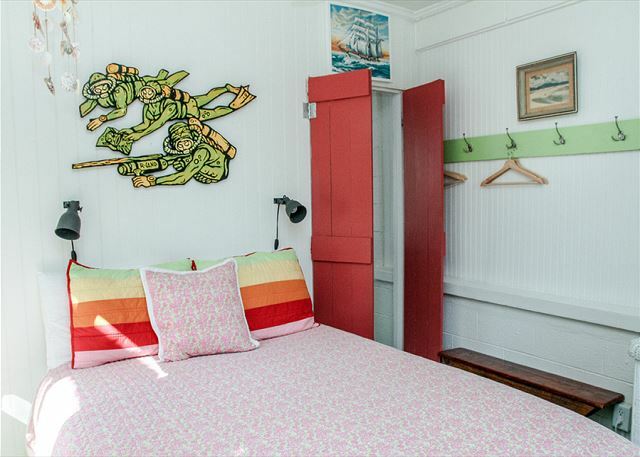 We would not hesitate to highly recommend Castaway Cottage and Tybee! It was everything we had hoped and even more than we expected!! The cottage was roomy. It had three bedrooms, 2 baths, kitchen, living room and extra room with a window seat. Our family of 6 had plenty of room. It was located across the main road from the beach. Easy and quick walk. You can walk to a few restaurants as well. The property allowed pets which was a requirement for us. The front of the property was fenced. There was however a board of the fence that was down. It did need to be repaired as small dogs could get through it. The mermaids were great to work with and willing to help if needed. The cottage was in a great location, close to the beach and to the grocery store. It was clean, well-furnished, and comfortable. We enjoyed our stay and the great communication from Mermaid Cottages along the way. Happy you enjoyed your stay! carol and the Mermaids ! We had a wonderful time on our first ever trip to Tybee Island and the mermaid cottages. We were thrilled with our cottage and would definitely recommend Tybee, Savannah and the Mermaid Cottages. This cottage was amazing!!!! Check-in was flawless! 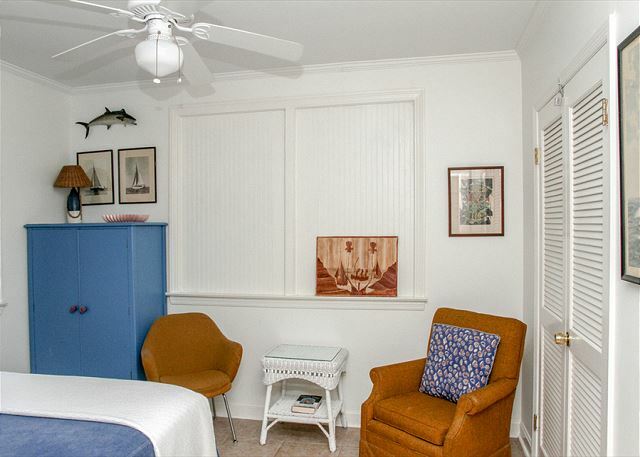 The cottage is spacious and is literally across the street from an access point to the beach. The neighbors are so friendly and the cottage is equipped with everything you need! We had a wonderful stay at Castaway. The home is in a great location - on a quiet neighborhood street, about a 5 minute walk to a lovely beach access. There are lots of nearby restaurants and even the grocery store is walking distance. The home itself is very cute. Two of the bedrooms are very well appointed. I will say the 3rd bedroom was not ideal - it's basically in a sunroom, surrounded by 2 walls of large windows, with very sheer curtains - so it's very bright in the mornings, and would not be an ideal place to take a daytime nap. The bed takes up almost the entire room. We were able to cook a meal in the kitchen, though basics like olive oil had to be purchased at the store. Really enjoyed our stay and would stay here again. Great cozy cottage for family time. The castaway was such a cozy, nice cottage. Beautifully decorated and had everything we could need. Will definetly be staying here again! We absolutely loved this cozy and relaxing cottage. It was lovely! Great location, comfy beds and adorable decorating. 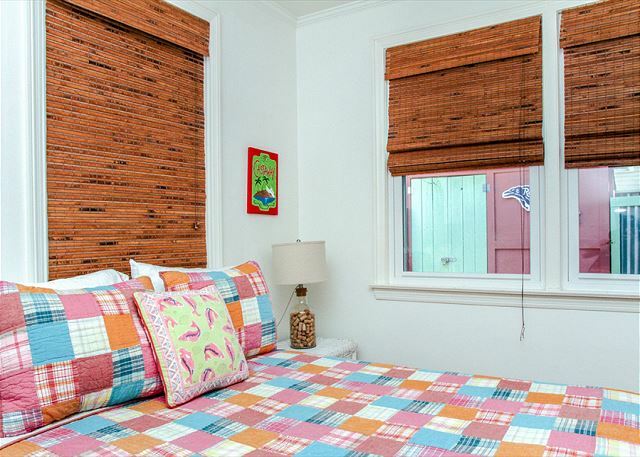 The windows in the smallest bedroom need blinds under the curtains to keep out morning sun. Other than that it is a 10! Had a great time. The cabin, Castaway, was in very nice condition. The décor was very appropriate to a beach stay and all was in working order. I would highly recommend to my friends. Great location, very clean, beautifully decorated, absolutely everything you need and want in a vacation house. Mermaid Cottage's were great to deal with from beginning to end. Just a fantastic experience. From start to finish of our trip we experienced nothing but first class communication, arrangements and professionalism. The house was perfect. Three friends who have not had a girls night in over forty year. Reunited for an amazing weekend. 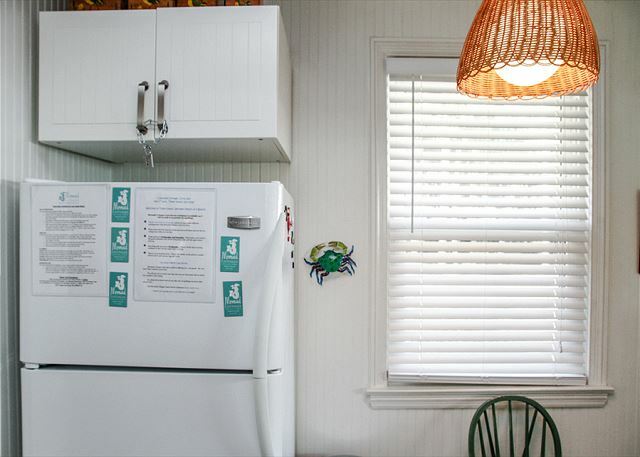 Our Tybee Island cottage was everything we wanted and more. Attention was paid to every detail to ensure our comfort and pleasure. Decorated like pages from Costal living. Great nieborhood.we came two weeks after the hurricane and the Island was still getting back on it's feet , but everyone made us feel so welcome.Tybee and the people are an experience you can't find anywhere else. Three on time friend stayed in the first night and over great delivery pizza reconnected and laughed in the warm of a cab that felt like home. Thank you to the wonderful people at Mermaid Cottages. Will never stay anyplace but in one of your cottages, when I am in Tybee. The Golden girls heard great music walked Sandy beaches, shopped in stores that offered so much more than the usual tourist ware and the food and people . Thank you for a weekend to remember. The Castaway Cottage was absolutely beautiful. We wish we could have stayed longer and plan to return! Girl's weekend was perfect! The house was perfect. Each bedroom was quiet and private. Living area was spacious. Kitchen was stocked as well as my kitchen at home. Cast Your Cares Away at Castaway! Fell in love with Castaway Cottage as soon as I opened the door. The house was cool (thank you for leaving the a/c on) and full of natural sunlight, not to mention the television was playing soft music. What a welcome! 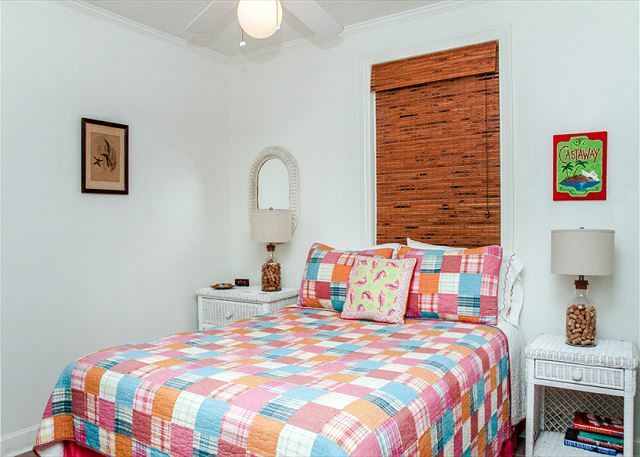 This décor is colorful and so bright it was like being at grandmother's house. Plenty of room for four adults. The property was even nicer than pictured online. From morning coffee in the sunroom to dinner done on the grill, everything needed for a relaxing stay was right there. Spent a few hours each day on the beach and the rest of the time at Castaway fellowshipping and relaxing with friends. I highly recommend this property to anyone visiting Tybee Island. Great cottage! Loved the outdoor shower! So glad you enjoyed Castaway and your Tybee time! Denise & the Mermaids. Loved our stay on Tybee! The Castaway Cottage was perfect- super clean, great floor plan, great location & the AC was amazing!! The only problem with the Castaway Cottage is having to leave! We enjoyed everything about it. Loved it last year and came back for a longer stay this time. 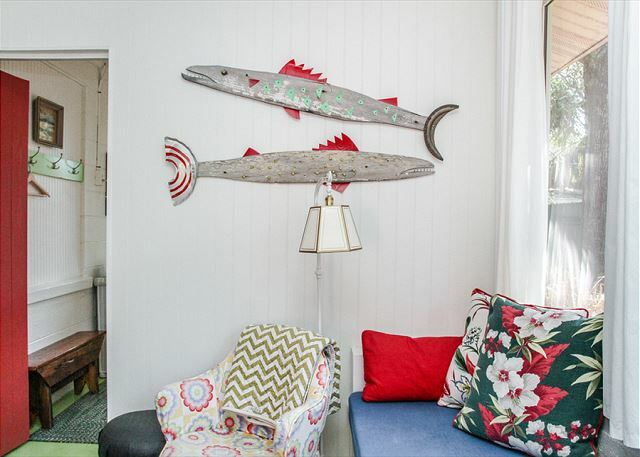 This is our second year staying in mermaid cottages and we are in love with the mermaids! The houses are adorable and every comfort is included. 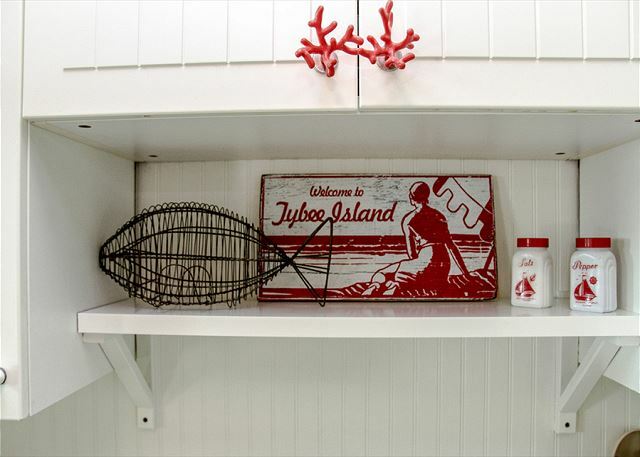 We love everything about Tybee and the cottages best of all! Very nice. The house is beautiful and very well equipped. The weather could have been better but I guess even mermaids can't control that! As always, Castaway was a wonderful place to enjoy peace and quiet and a retreat from the realities of day to day life. We have been coming here in May for years and hope to keep doing so. Castaway is in a great location and is quiet and peaceful! And is in pristine condition. Can't say enough good stuff about it and the management! Our stay at Castaway Cottage was delightful! It was such a quaint little cottage filled with lots of Vintage/cottage old time feel with modern conveniences thrown in to make your stay comfortable. It had everything you could have needed to make you feel at home and relaxed! My son and I loved this cottage! And the mermaids have thought of everything with all the right extras. Just a couple blocks from the beach, it's the kind of place you want to call home indefinitely! Great outdoor spaces and plenty of room inside with two separate sitting areas, a well-equipped kitchen, and comfy bedrooms with plenty of space to get settled in. We loved our visit and we were sad to leave. Can't wait to get back to Castaway soon! Very nice. The only negative I have is there were dirty coffee mugs in the sink when we arrived (no biggie), The bathroom door that leads out has huge gaps (easy access for bugs; however we did not have an issue with bugs) and the door in the kitchen (the screen door) needs to be replaced or something, it is a pain to open! Again, not anything major just some things we noticed. Castaway Cottage was the perfect size for our family, and just a short walk from the beach and the grocery store. The cottage was clean and well-equipped with everything we could need and the "mermaids" made us so comfortable and welcome. We'll be back soon - thank you, Mermaid Cottages, for a perfect little getaway. Awesome! love the house. and space. The only negative thing was that there was not alot of storage space in the bedrooms for clothes. This has been an awesome place to stay. 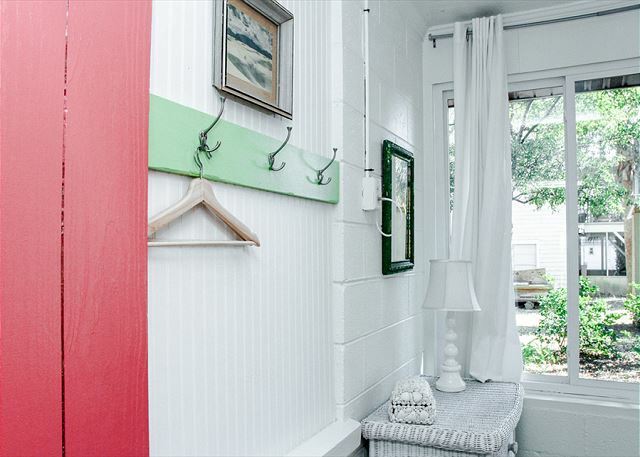 It's eclectic decor and bright colors only add to the ambiance. It's the first vacation that we have been able to take in quite a few years. We will definitely be back and staying longer. Everyone at Mermaid Cottages has been extremely helpful, nice and professional. I could go on and on, I'll just end it by saying I recommend "castaway " cottage to everyone! 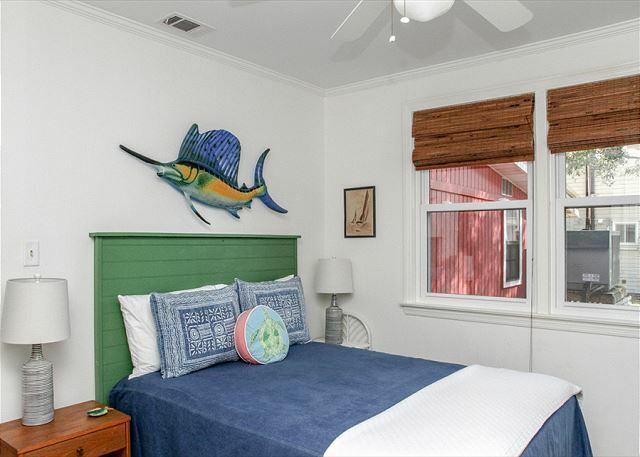 There is NO better place to stay in Tybee than at any of the many Mermaid cottages that are the closest thing to HOME and HEAVEN. This was our 2nd cottage to stay for vacation and definitely didn't disappoint. 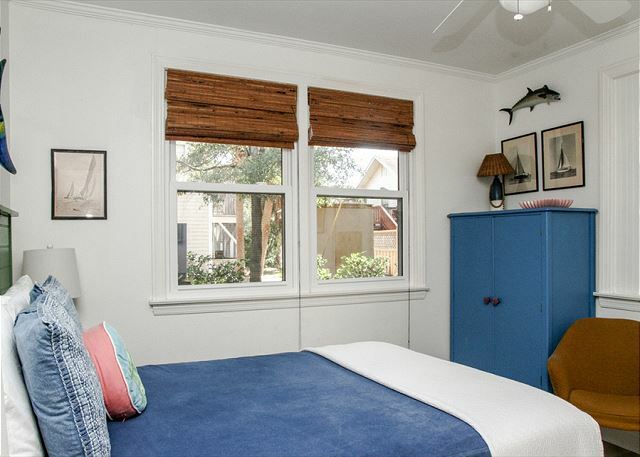 Only 2 blocks from beach and many attractions. We walked to restaurants nightly and along the beach in the mornings. Very clean and staff attentive upon our arrival to ensure we had everything we needed! A MUST to stay for your next Tybee visit! We stayed at Castaway Cottage for a weekmover the 4th of July holiday. 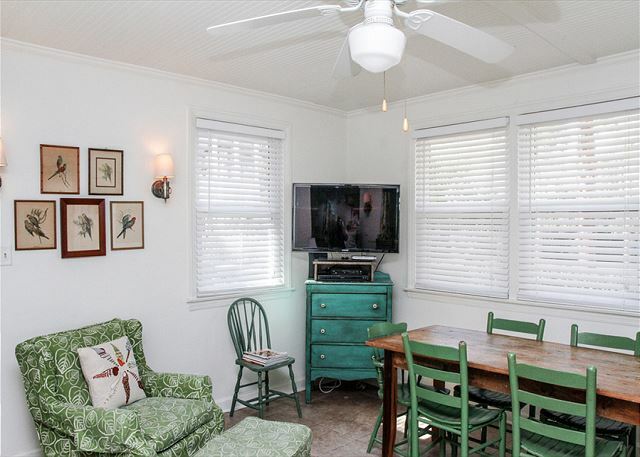 We had never been to Tybee before and could not have been more pleased with our decision to stay at a Mermaid Cottage, and Castaway in particular. The cottage was so clean, decorated beautifully and most important, comfortable! We felt right at home, had tons of space and everything we needed to make our stay easy. We have 2 small children, ages 3 and 5, and this cottage was perfect. 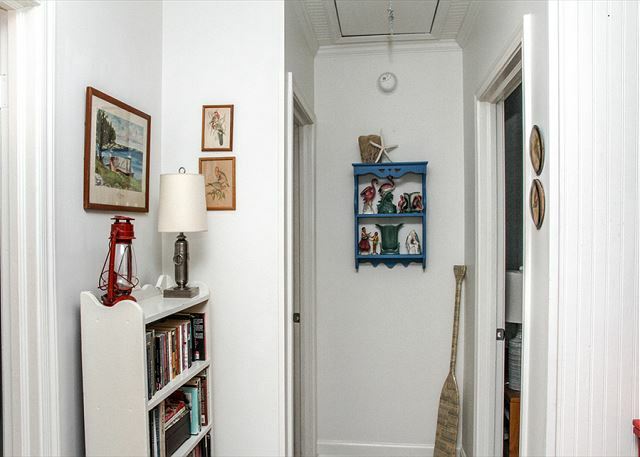 A great location, short walk to the beach and right on the bike path. The mermaids were wonderful...we did not need anything during our stay, but if we had I know they would have been there immediately to take care of our needs. Truly a beautiful cottage which made for a wonderful family vacation! a guest from Stillwater , OK does not recommend this vacation rental. We were satisfied overall with the property. I would like to make a suggestion that you put a note by the master bathroom warning people that it is two steps down. My 72 year old mother missed them completely and fell face first. We were not impressed with the beach at Tybee, one evening while walking my daughter and husband found the stem of a broken wine class sticking up from the sand and a board with nails in it laying on the beach. Great little vacation. Easy walk to the beach. Equipped house. Clean. We had a wonderful stay. The cottage was just perfect. We brought our children and they each had their own room. The cottage was in a great location, and it was really clean and very comfortable. Everything was just perfect! We will be staying again next year! My sister, my cousin and I stayed in Castaway Cottage for four nights at the beginning of June. We loved the cottage. It is very cutely decorated and it was very clean when we arrived, thanks to Natalie. We had trouble with the key box and the Mermaids had someone out to our cottage within ten minutes (operator error I might add!). Castaway Cottage is located in a quiet neighborhood within walking distance to the beach and is only a couple of blocks from the IGA store. You can walk to several restaurants and to the pier. We would definitely stay at Castaway Cottage again. This house will be my favorite memory of a great vacation. It is so well designed, comfortable and charming. The kitchen was well equipped. We had a gathering of 12 people and there was everything we needed for a large dinner party. I loved the outdoor spaces, including the shower,as well as the indoor comfort. A walk to the beach, a cool breezeway, and a happy vibe! What's not to love? We didn't want to leave. We had a great time at Castaway. Loved all the detail in the decor. Casual and laid back, just perfect for a few days at the beach. Perfect Quiet Retreat, Yet Close to Everything! Once again, after many years coming here, the place was clean, quiet, and in a perfect location.The manager and staff are attentive to one's needs and always make your stay great! We will keep coming back - no doubt about it! We rented Castaway for a "stay-cation." Being from Savannah we know Tybee well. Castaway is a beautiful, well maintained home on a quiet street suitable for families with kids. Natalie does a great job keeping Castaway looking top notch. We choose Castaway because of the great location. Having two small children we wanted a property that was walk-able to the beach and to all the great restaurants on the south end. Our favorite is Tybee Island Social Club which was a short walk from Castaway. We even had a celebrity sighting while dining enjoying dinner there! The folks at Mermaid Cottages are professional and courteous. A two-day getaway with a childhood friend. 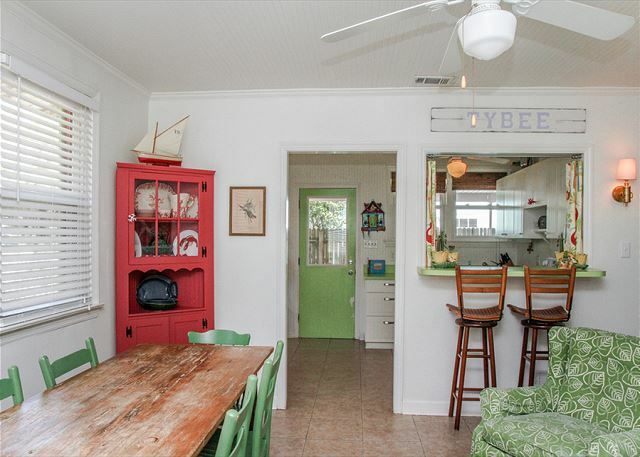 Perfect location on Tybee, 2nd Ave and 9th Street. Most everything we wanted to do within walking distance. Great Mermaid service and exactly what you would expect in a Mermaid property - clean, well-equipped, well-decorated and a little eclectic. The Mermaids are always very responsive to needs. I love their smartphone app … it made check-in and check-out a breeze, and provided us with tons of useful information. We've rented from Mermaid Cottages many times in the past, all over the island, and this was another great experience. Had an awesome experience from booking with Denise, to checkout. The house was clean and everything we needed for cooking. The house is so charming. Not one complaint. Plan to stay again in the future. I have already recommended this house to my co workers. Week plus stay. 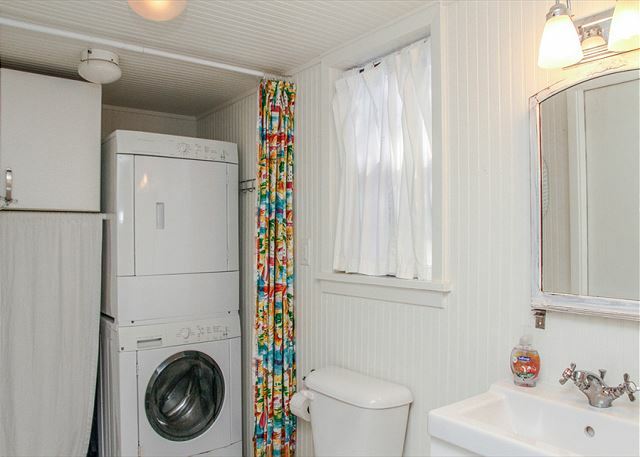 Vintage cottage with modern conveniences. Clean and comfortable. Loved the island and day trips to Savannah. The people at Mermaid Cottages are wonderful to work with. The cottage was very clean and equipped with everything we needed. It is perfect location and an excellent value for what you get. I also love the app they offer for renters that is full of information. Castaway Mermaid Cottage is paradise! We had such a wonderful relaxing stay. The cottage was decorated wonderful. Loved all the period pieces. No detail to small. SO SO clean. Comfortable. The Mermaids were there if you needed anything. But we didn't need to contact them everything was perfect. Walking distance to anything and everything. Can't wait to come again! Thank you !! Castaway Cottage was the best! Communication with them was incredible! Everything they promised was true, plus more! Every detail was perfect! If I ever go back, or know someone who is going there, Mermaid Cottages would be the only place to stay! We spent a week at the cottage and loved it. We had late afternoon thunderstorms so the carport area was awesome. We could still sit outside and keep all of our stuff from the beach dry. The cottage was a little roomier than expected and we all enjoyed the outdoor shower. We will be staying there again. 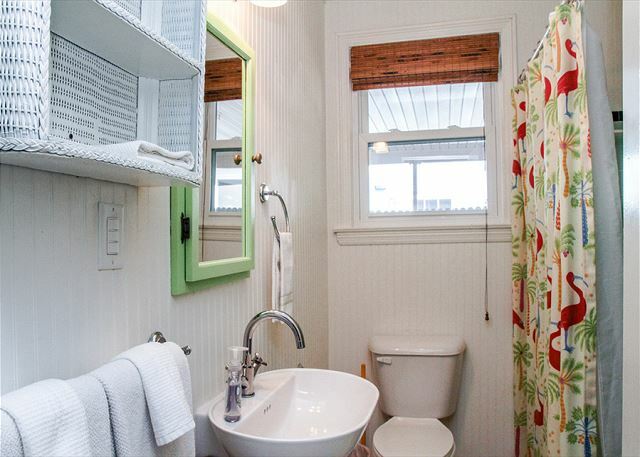 Cottage was just what we wanted....clean,cheerful, cozy and close to everything! We LOVED staying at the castaway cottage! From the second we walked in we were comfortable and very pleased with everything! The cottage was so clean, and had EVERYTHING we needed. Thank you Mermaid cottages for giving us the perfect Anniversary vacation!!! This was also our first trip with our 1 year old and everything was perfect! We can't wait to come back! Great rental house with a great rental company! We loved staying at Castaway. Everything was clean and pleasant. Close to the beach and not far from downtown. This is our second year at Castaway and our fifth with mermaid cottage rentals and we were happy as always with our stay. They called several times to see if we needed anything and to make sure our stay was going well. 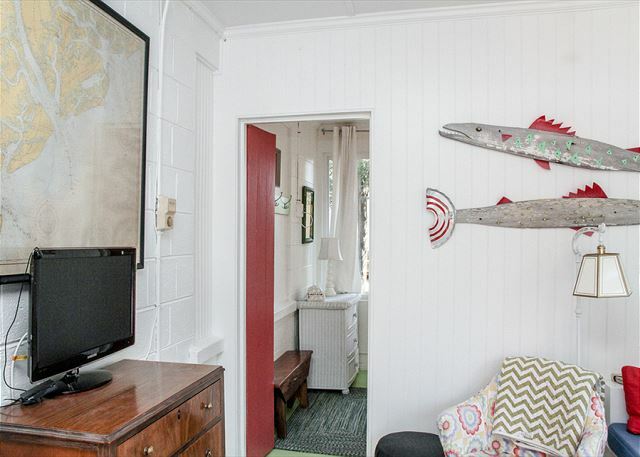 We will definitely rent from Mermaid Cottages again. We loved Castaway's funky beach vibe! The house was very clean & comfy. The kitchen had everything we needed, and the Mermaids leave you with all the basics you would normally have to buy on your first day(toilet paper, coffee, dish detergent, etc). We loved the location. It was not too far from restaurants, but in a quieter & less crowded area of the beach- plenty of room to spread out. We would definitley recommend Castaway to friends! The search for the perfect cottage ends here! Mermaid Cottages never disappoint, but this cottage was our favorite so far. The location on the bike route was ideal for our young, sometimes wobbly riders. My parents enjoyed opening the living room blinds and watching the world run/bike/rollerblade by. The layout of the cottage provided a wing for the kids. If you are wondering if the bench in the enclosed porch works for sleeping, our teenaged nephew slept there like a baby. The cottage was super clean. My dad has pet allergies, and he had no idea it was a pet friendly cottage. Not one sneeze was heard. Thanks, again, for ensuring our week was perfect in every way. See you as soon as possible. Absolutely awesome! From the booking to the Mermaids ensuring we knew all the fun food and activities in which to participate to providing a clean, well-stocked cottage - our first trip to Tybee was memorable and fun! Cottage was wonderful; clean, bright and cheerful. Staff was efficient and delightful. Will definitely come back again. thank you!! we loved having you and your wedding party stay with us! Very comfortable place enjoyed by a family of 4 which included a 7+5 year old, and my in-laws. 2 full baths, outdoor shower, 2 tv's (including HBO), plus pet friendly made it a great place to call home for the week. A quick walk to the beach, and quiet shaded street for wlaks/runs/bike rides. We had a fabulous stay at our Castaway Cottage, could not have been more perfect. Props to Anna, cottage was in tiptop condition. We will most definitely be back. We had the best time staying at this cottage! It was so spacious and we loved being only two blocks away from the beach ! My high school girlfriends and I rented this beautiful little vacation cottage the last of May & it was absolutely wonderful!! We loved the way it was decorated inside, enjoyed every room! It was close to Tybee beach & the drive in to Savannah was really quick, so you could sight see along the way! We found our little cottage just like the description, warm, clean & convenient! We loved that it was close to all the GOOD restaurants, as we didn't cook!! 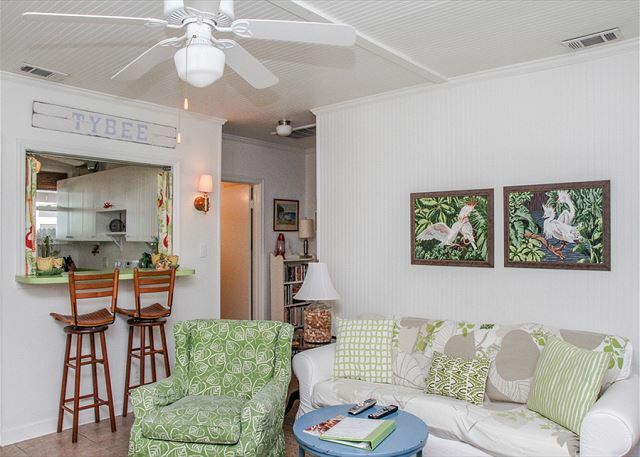 We would recommend this little getaway to anyone wanting a great little cottage for a stay at Tybee! We'll be back!! Great time again, as usual. Castaway was neat, clean and convenient to beach and town. We love staying there! Have been doing so for years. We will be back again next year. The management is so ready to help with any request. Maintenance came within an hour to fix a minor glitch in the shower. Wonderful place and staff! We loved castaway cottage. It was adorable and beachy and comfortable for our family of five. It was very clean (thanks Anna)and equipped with everything we needed. The island is lovely and the beach only A few short blocks away. We enjoyed a day trip to savannah (trolley tour) went to the lighthouse and rode bikes all around town. And we went to the beach twice a day including early one morning to see the sunrise. We had a most relaxing and fun vacation. This cottage was perfect for us. Two adults and two kids (18 & 12). The cottage is beautifully decorated and has great sitting areas inside and outside. We had a wonderful time staying in your quaint cottage. It was on a quiet street, nice and dark bedrooms, very relaxing, which was exactly what we were looking for. The Castaway cottage was a perfect place for our family's stay on Tybee: very clean, well appointed and a close walk to the beach. Linda was incredibly helpful and gracious. We will be back.Thanks! Outstanding experience from the reservation through the vacation. Clean, as described, PERFECT location to walk to the st. Patrick's day parade and all around wonderful. Thank you mermaid cottages and all the great "mermaids"! Castaway is perfect in every way! Everyone in our little group loved the décor and the space. 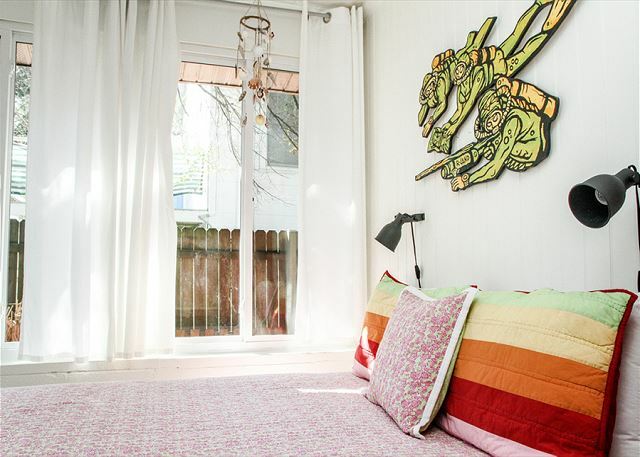 Colorful, cheery, and comfortable in a compact space. Great food at the restaurants we visited...Tybee Social Club, Sunday Café, The Breakfast Club (line forms, so get there early), and Macalwees. Check out the oyster roast at the American Legion held once a month...I think. FABULOUS stay on Tybee! Great cottage for gathering of friends. Clean, well decorated and situated on the island. We enjoyed walking through the neighborhood to local restaurants and the beach. Really welcoming and comfortable cottage. Castaway will make you want to return. My group of 11 came to Tybee Island for my bachelorette party and rented the Castaway and the Breeze Inn next door to it. The homes were so comfortable, walking distance to the beach, decorated adorably and the check in process was almost TOO easy. I can't recommend this enough! The house was wonderful and very comfortable, as described on the web site. I loved the décor and the location. Our family had a great time. We enjoyed a trip to Savannah, eating at Sundae Café, Sting Ray's and Sugar Shack. The beaches were great but a "potty" at each beach would be nice. Perfect place to come 'home' too! 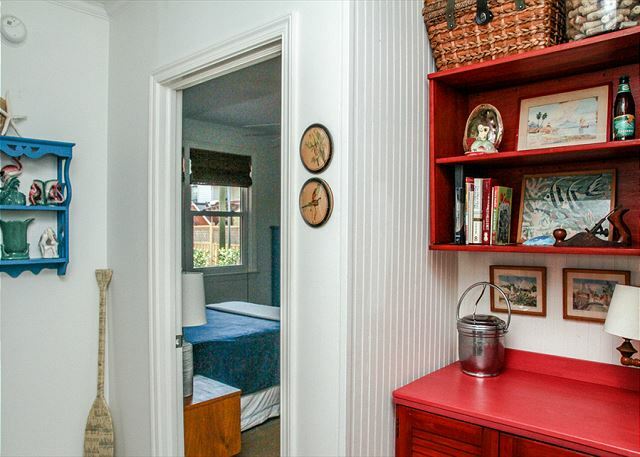 What a wonderful, cheery cottage to stay in. The place was clean, bright and beautifully decorated. Every consideration was in place, as well. before we arrived. Thanks so much Mermaids :) PS Anne- You did a wonderful job cleaning! This house was amazing. It had EVERYTHING we needed, and was so comfortable and decorated perfectly. It was only 3 blocks from the beach and extremely close to the restaurants we love! We came down with a group of friends for my boyfriend's 31st and Carol made it so special! She hung up a personalized banner I sent down, had balloons everywhere, a banner inside, and it was so sweet of her to make sure that those special personalizations were made. He loved it! So thank you Carol! Anna also does a great job at cleaning the house and making you feel right at home. Mermaid Cottages is a great rental group to go through and I will use them again! My boyfriend proposed to me in the living room of this house, now it has even more character... 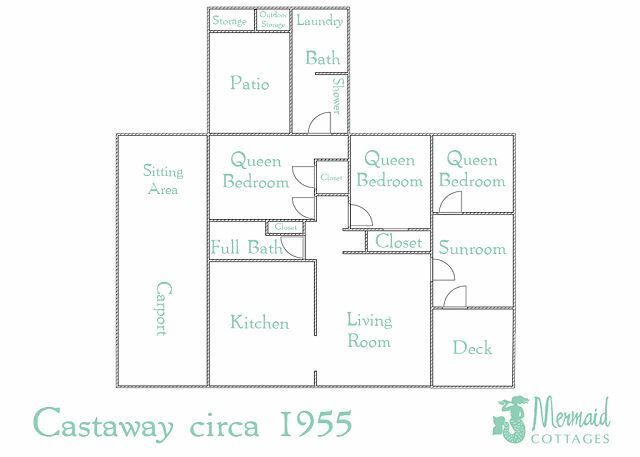 I hope others can make memories just as special at Castaway Cottage! Thanks Mermaids, it was AWESOME! Enjoyed the accommodations ... very clean, well-kept, bright and roomy. Convenient to the beach and local shops. Our stay at Castaway was fantastic! The cottage was darling, and very clean. (Thanks Anna) There was plenty of bedding, and nice thick towels. I especially loved the dark colored washcloths for makeup. The outdoor shower was used more than any other shower. Essential for 3 kids and the beach! Carol made the reservation process easy. We are already talking about returning next summer. We had a wonderful week visiting Tybee. Castaway was very cozy and relaxing. Anna did a very nice job preparing it for us. 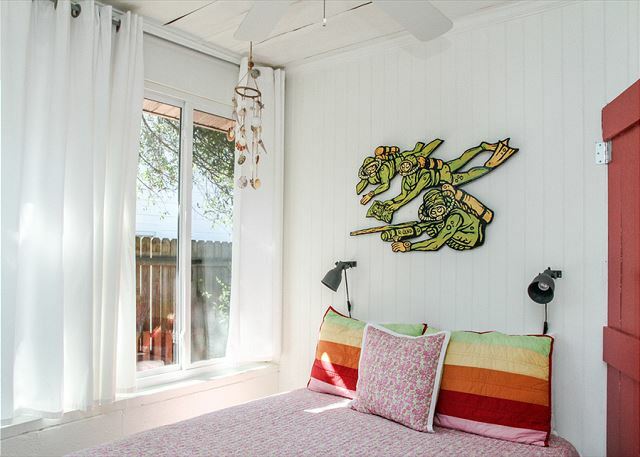 We love mermaid cottages and can't wait to return! 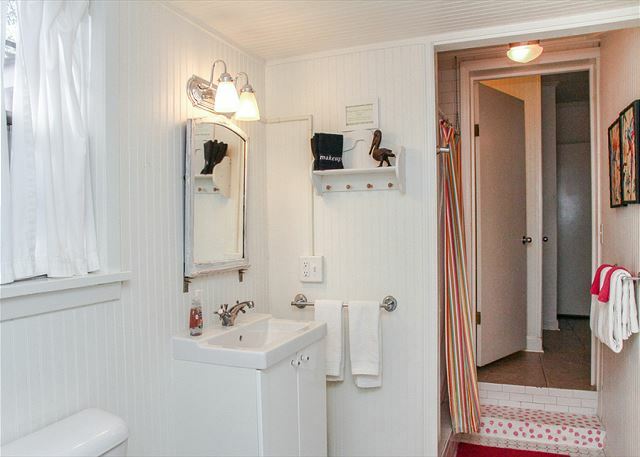 One suggestion for the cottage would be more towels. We felt one set per person wasn't quite enough for a week stay. Wonderful vacation in cutest cottage ever! We had a fantastic time at this precious cottage! The pictures do not even do it justice--- it is so cozy, comfy, colorful. i want it. When we arrived early, mermaid Anna was finishing up and was so accomodating and really friendly. We rested so well here, had perfect beach weather, saw dolphins, and had great family time. We will definitely be back! Thanks to y'all, we had a wonderful holiday vacation to the beach. So, so happy with all the amenities, cleanliness, decor, comfort of Castaway. The third bedroom does lack same level of appeal and comfort of rest of cottage, and Could use some attention, in our opinion. Special thanks to Anna for her attention to detail in cleaning the whole house, top to bottom. Her effort really shows. Thanks, again, Mermaids! 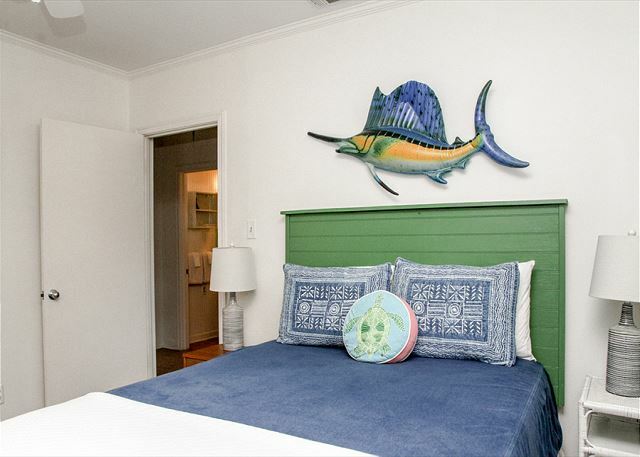 We WILL be back to Tybee and look forward to another wonderful stay in a Mermaid Cottage. Castaway is a great cottage!! It was a girl's week away with our "furry babies". The house was super clean and had all the amenities one could want. Great location on the quiet bike path. Super short walk to the beach and the IGA (where you MUST get up early and take advantage of their homemade cinnamon rolls at the deli....but, hurry....they don't last long!). 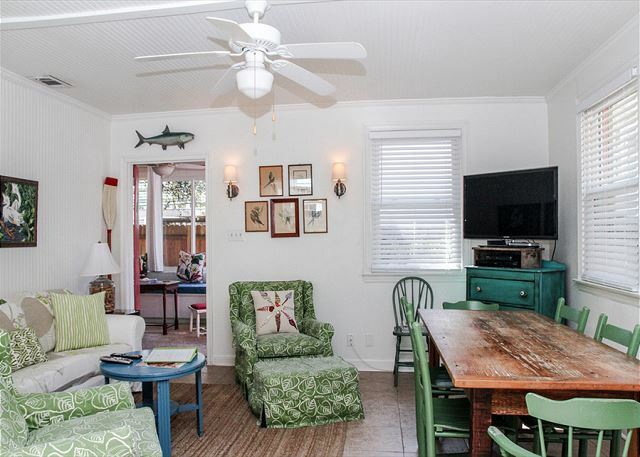 We always rent through Mermaid Cottages and have never been disappointed. I highly recommend Castaway....you won't be disappointed. Great Stay - As Usual! Once again, for about the 6th year or more, we had a great stay at Castaway. Anna did a great job cleaning the house for us before arrival, and it was perfect. 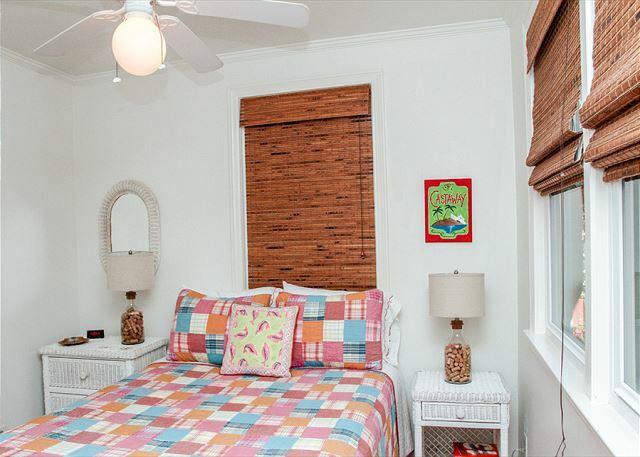 We love the location and the proximity to the beach as well as the downtown and restaurants. (we do bike most places). Hoping to come again next year and stay again! As always, the Mermaids made everything wonderful! Castaway was spotless, adorable, location was convenient to everything. Even though the weather was rainy we had a relaxing & wonderful weekend. Love the Mermaids! We only had two days to cram as much as we could into our Tybee Island stay! Our first stay with Mermaid Cottages was at the Castaway. It was such a cute cottage and we had fun just looking at all the fun décor and items in the cottage! So quaint! We stayed next to the Breeze Inn and were hoping to catch a glimpse of Mary Kay Andrews! We definitely needed more time to drive around the island and see all there was to see. Each restaurant we ate at was great. Loved the "Seaside Sisters" store and other fun shops. The weather was a little cool. Would love to come back again when the weather was a little warmer and we could stay longer! A big thank you to Mermaid Cottages for a fun stay! Tybee Island was a delight to visit, but our cottage was THE BEST!! It was so well decorated, was completed furnished and appointed with everything we needed, and the Mermaid crew was available 24/7 if we needed them. Cottage was **** and span clean. We were right in the middle of the island which was perfect. There was outdoor space in the sun, and in the shade. Outdoor shower was private and connected to an inside bathroom. Can't imagine what would make this cottage better. You have gotta go here! The Castaway House is wonderful!! It is a charming place to stay! Loved that I could bring my dog with me.I am hoping to stay there many more times. I love everything about Tybee and Mermaid Cottages staff and rental property. The Castaway was nicely decorated and comfortable. My best friend and her teenage daughter and a friend joined us and it was great. The teens stayed in the back bedroom with the sunroom and they had a blast. The only complaint was that the kitchen was poorly stocked. We cook and there just wasn't much to choose from and the pots and pans were in bad shape! Other than that it was great. This is our second stay on Tybee and staying in a Mermaid Cottage, we had such a good time, the charm of the houses that are perfectly equipped for a girls trip: several outdoor patios for lounging around, a kitchen fully stocked for cooking, outdoor shower, walking distance to the beach and local grocery store. We know we'll be back and we know we can find the perfect location and house through Mermaid Cottages. This beach rental was perfect! It was even cleaner and nicer than originally expected. There is a large sunroom taht I spent most of my time in. You can read in the window and close the doors to shut yourself off from the noise in the rest of the house. There is a great outdoor shower and they provide a Weber grill for cooking. This is a must-rent property. We will DEFINITELY be back! Loved loved loved the house! Great value for the space and location was ideal - in middle of island. Easy to ride bikes, quiet neighborhood. We will be back!